FILE - Uighurs rest near a food stall and Beijing Olympic Games billboards in Kashgar in China's western Xinjiang province, Aug. 30, 2016. Zhang Haitao was a rare voice in China, a member of the ethnic Han majority who for years criticized the government on social media for its treatment of the minority Muslim Uighurs. FILE - Kyrgyz police officers look at the Chinese Embassy after a suicide bombing in Bishkek, Kyrgyzstan, Aug. 30, 2016. In the past two years, militants belonging to the Uighur ethnic group native to the vast Xinjiang region in western China have shown signs of becoming a force in Islamic extremism globally. Court records say Zhang was convicted of sending 274 posts from 2010 to 2015 on Chinese social media sites Weibo and WeChat that “resisted, attacked and smeared” the Communist Party and its policies, earning him 15 years in prison for inciting subversion of state power. He was given another five years for talking to foreign reporters and providing photos of the intense police presence in the streets of Xinjiang. That, the court said, amounted to providing intelligence about China’s anti-terror efforts to foreign organizations. In this May 10, 1994, file photo, Nelson Mandela, left, takes the oath of office in Pretoria, South Africa, to become the country's first black President. A man walks along a street at night in the old town of Kashgar, Xinjiang Uighur Autonomous Region, China, March 23, 2017. 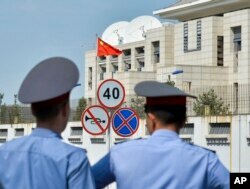 Thousands of "convenience police stations" have been built across Xinjiang. They are typically just hundreds of meters apart. Wang Lixiong, a Han Chinese writer and dissident, said that when it comes to Xinjiang, even calls for dialogue can result in imprisonment. A month ago, she sneaked away and made her way to Bangkok. With the help of U.S. aid organizations, she flew to Texas, where a host family had been found for her, and where she hopes to start a new life with her son.